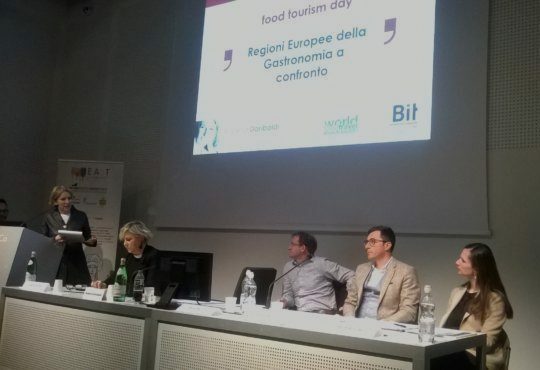 The Bit 2018 “Your Travel exhibition” held in Milan from 10 to 12 February has been the framework for some of the European Regions of Gastronomy to meet and assess the current situation. During the session titled “A comparison among European Regions of Gastronomy” the Platform members discussed the important results achieved till now as well as future programmes. East Lombardy, European Region of Gastronomy awarded for the year 2017, assessed the positive outcomes achieved during the year of the Award. Roberta Garibaldi and Laura Castelletti explained that the area, which reunites the Brescia, Bergamo, Mantova and Cremona Provinces, developed a strong networking collaboration involving more than 1100 stakeholders, in order to promote these territories valorizing the rich gastronomy and culture. The year just ended characterized by events, educational workshops, toolkit development and fairs constitutes the solid basis for future progress aimed to promote a sustainable tourism model with a bottom-up approach. Present at the session also Galway, West of Ireland, European Region of Gastronomy 2018 represented by Brian Barrett, Sibiu, represented by Maximilian Dragan and South Aegean, represented by Heidi Lazani, Europeans Regions of Gastronomy 2019. Galway, West of Ireland has just inaugurated this year full of events, which will see the GMIT (Galway – Mayo Institute of Technology) as the setting for the European Young Chef Award 2018 in November. Galway counts 15 festivals during the year, just to make two examples, the Clarenbridge Oyster Festival based on the Oyster tradition and the Food on the Edge Festival which faces food concerns in modern time. Their programme as Region of Gastronomy 2018 will focus on health and education, linking urban-rural, feeding the planet, sustainability, innovation and SMEs support. North Brabant, Netherlands is the other Region awarded for the year 2018, Better Food in Brabant is the slogan under which they will propose a thematic event each month from March to December focusing on healthy food, traditions, food waste, involving local communities and the rural sphere. 2019 will see Sibiu and South Aegean as protagonists; Sibiu in Romania after being awarded as European Capital of Culture in 2007, had implemented a programme focused on Gastronomy able to make the Region attractive and unique from a touristic point of view. Finally, South Aegean, which obtained the Award thanks to the Taste the Season programme, was able to achieve the cooperation between 117 actors on the territory with the aim to connect the principal pillars on which this area is based: tourism, local production and cultural tangible and intangible heritage developing different initiatives ranging from health to digital themes. The European Region of Gastronomy Platform and Award aim to contribute to better quality of life in European regions, by highlighting distinctive food cultures, educating for better health and sustainability, and stimulating gastronomic innovation. It provides cross-marketing opportunities and longer-term benefits. Being part of the European Region of Gastronomy Platform and bidding for the award brings a range of stakeholders together to confront development challenges in the region.